Aquariums are a fulfilling hobby, providing hours of enjoyment. They can be a great avenue for kids to learn about ecosystems, and they can also help provide relief from the stress of everyday life. They do require some work, planning, and foresight. 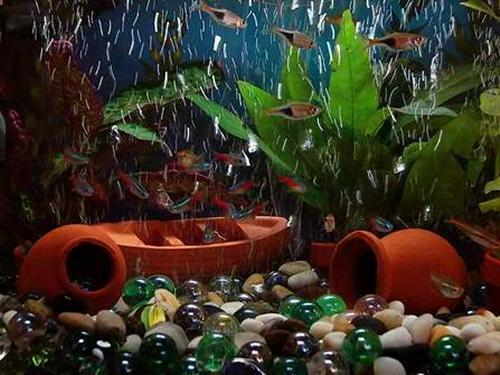 If you are a newbie, you should have a list of must-have aquarium accessories that will help create the best aquatic environment for your fish and other tank inhabitants. Basically, your aquarium filter works in three different ways-biological filtration, mechanical filtration, and chemical filtration. Some of the most common types of filters include canister filters, power filters, wet/dry filters, and fluidized filters. Make sure to choose the best size that will suit the dimensions of your tank. Always remember that filter cartridges need to be changed at least once a month. The type of light suitable for your aquarium will depend on the type of fish you intend to keep and your budget. Colored tube lights are less expensive than led lights; however led light enhances the visual appearance of the aquascape. You can choose from tube lights, screw on lights, hang on lights, and clip on lights, depending on your tank's fittings. A good quality tank heater has a built in thermostat. This is one of the most important accessories of an aquarium, especially if the environmental temperature greatly fluctuates at specific times throughout the year. You can get wired or wireless heaters to help maintain a stable temperature at all times. A thermometer will help ensure that the specific temperature requirements of your fish species are constantly met. Aeration in the tank provides an extra boost of oxygen to the water. A bucket will always come in handy when making water changes. The bucket you use should be used only for cleaning the aquarium, and not for any other purpose. Don't use soap to clean the new bucket; use warm water, instead. Gravel cleaners help siphon off the debris and fish poop without removing the tank substrate. You can choose between a manual gravel cleaner and an automatic gravel cleaner. A sponge will help keep your aquarium clean. Use a soft sponge if you have an acrylic tank, while glass aquarium can tolerate rough and hard sponges. Water conditioners are added to tap water before being poured into the aquarium. The addition of water conditioners to tap water effectively removes chlorine and heavy metals present in it. You will need a net to safely remove the fish from your aquarium. Test kits will help you monitor and maintain the important parameters that influence water quality. You will need test kits, pH adjusters, buffers, and other miscellaneous chemicals that will help maintain water quality. A strong stand will provide a solid and reliable support to your aquarium. Find a place where your tank is located away from direct sunlight, air vents, windows, or heaters.